Who would have thought a photo of a mess of a dinner sans the recipe would cause such an uproar. I mean a happy uproar of sorts. Sorry folks, I didn’t mean to tease you all yesterday. In response, I’ve spent some time today racking my brain, a task in and of itself and pulled it all together for ya. The easiest way to make the filling is by using a slow-cooker, but if you don’t have one do not despair. If you’re like me, you may be someone who swore they’d never own a slow-cooker. Growing up, I remember coming home from school, inhaling the scent and then confirming what I already knew as I walked into the kitchen. Brunswick Stew for dinner. Ugh! The sight of that avocado green slow cooker (you know your mom had one too) on the counter was enough to make me dread dinner and beg for an alternative. Oh, did I loath that machine and what it gave birth to. My mother has always been a great cook and my hatred for that dinner has nothing to do with her skills. But I swear, nothing I ever liked ever came out of her slow-cooker. Hence, I moved into adulthood believing that nothing good can come from a slow-cooker. That is, until I really started cooking and discovered the magic this little gem of an appliance can have upon food! I’ve been converted and healed. I love my slow-cooker, but you’ll never get me to make Brunswick Stew. Ever. So if you don’t have a slow-cooker, do yourself a favor and go get one! You’ll thank me later and trust me, it’ll be your go-to, make my life easier in the kitchen, keep my family happy appliance. Based off of the Cooks Illustrated version, here is our version of Enchiladas Verdes. Keep in mind, portions are written to the best approximation to how I make this. If you’re looking for exact and precise cooking instructions, I’m not your girl. Remove husks and stems of Tomatillos and rinse (they are sticky). Roast Tomatillos, Garlic (skins on), Serrano peppers until lightly charred. You will have to rotate to get all sides charred. Remove the seeds and stem from the Serrano chilies and remove garlic from the shells. Add the Tomatillos to the blender and pulse until a rough consistency. Remove Tomatillos from blender, leaving some liquid behind. Add Lime Juice, Garlic, Serrano Peppers, Sugar and Red Onion to the remaining juice in blender. Pulse a few times. Add the Tomatillos and pulse 1-2 times to combine. Finished product should be chunky. Salt to taste and refrigerate until ready to use. Cook for about 3-4 hours until your chicken is falling apart and can be shredded with a fork. Place contents of slow cooker (including as much of the liquid as possible) into a large bowl to shred. Once cooled a little, add about 1/2 cup of chopped Cilantro and 2 cups of shredded Pepper Jack Cheese. Combine well. Set aside or refrigerate until you are ready to assemble. 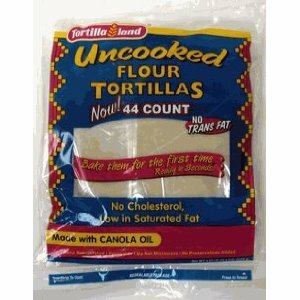 I like to use flour tortillas, and prefer a style available at Costco here in ATL in the refrigerator section where they sell the cheeses. They are uncooked and you cook them at home on your griddle. They are sooooo good and fresh tasting. These are so far the closest thing to what I get in Tucson, AZ when we hang with the Hoover’s. Use what you want, I’m just sharing what I use. Fill your tortillas with the filling and place them in your baking dish. Make sure that you have put a thin layer of the Salsa Verde on the bottom of the dish so the Enchiladas will not stick. Cover the Enchiladas with a generous portion of the Salsa Verde and some more grated Pepper Jack Cheese and bake in the oven until bubbly (about 20 min). Top with sliced Green Onions and chopped Cilantro and then drizzle sour cream over the top. Serve with a smile and maybe a super yummy Margarita with Organic Blue Agave Nectar and enjoy! I hope I covered all the ingredients and got it all right! You never can trust a cook who’s missing some of her brain! seriously jen, have you ever thought about applying for your own show on food network? your recipes are amazing, not to mention tasty- and you certainly have the stories to go along with it. you are such a role model for so many ladies, that this would only enhance it. i would watch your show and would be the first one to purchase your cookbooks…. Love it! Can’t wait to make this – thanks for sharing – love your posts!! Enjoy the weekend! I think this is what I had at the luncheon. If so they were delicious! Now I can do it. Sounds delicious! If you were not a consumer of dairy, what would you suggest to substitute for the cheese in the filling? I am concerned about it holding together. Any ideas? What about a soy cheese? I am pretty sure there is a Soy Pepper Jack available too. Try Whole Foods. Hope that helps! Hooray!!! I guess my sarcasm was enough to get the recipe posted…thank you! I can’t wait to make this, and I know my family will LOVE it. Thanks for sharing. Oh, and I totally agree, a slow cooker can be a busy mom’s best friend. I aim to please girl. Let me know what the family thinks and have a great weekend. I plan to make this dish. I made your banana chocolate chip muffins and the were deeeelicous!! I hope you enjoy the Enchiladas and I am thrilled to hear you enjoyed the muffins! Take care and have a great weekend!